Zakho (Kurdish: Zaxo, ; زاخۆ; Syriac: ܙܟܼܘ; Zāḫū) is a city, centre of the eponymous Zakho District of the Dohuk Governorate of Iraqi Kurdistan, located a few kilometers from the Iraqi-Turkish border. The city has a population of 350,000. It may have originally begun on a small island surrounded on all sides by the Little Khabur river, which flows through the modern city. The Khabur flows west from Zakho to form the border between Iraq and Turkey, continuing into the Tigris. The most important rivers in the area are the Zeriza, Seerkotik and the aforementioned Little Khabur. In July 2010 Zakho became the seat of the University of Zakho. The university is one of the eleven public universities of Kurdistan Region. There are several theories concerning the derivation of the name "Zakho". Some Aramaic sources maintain that the name comes from the Aramaic "Zakhota" (victory), after the battle fought between the Romans and the Persians near the city, which resulted in a Roman victory. Another version maintains that the name comes from the Kurdish words "Zey- Khowin" ("river of blood"), possibly referring to the same battle. A third opinion attributes the name to the Kurdish "Zey" (river) and "Khowak" (a curved place which blocks the water). The town of Zakho was known to the ancient Greeks. In 1844. the traveller William Francis Ainsworth commented: "The appearance of Zakho in the present day coincides in a remarkable manner with what it was described to be in the time of Xenophon." Gertrude Bell was convinced that Zakho was same place as the ancient town of Hasaniyeh. She also reported that the first Christian missionary to the region, the Dominican monk Poldo Soldini, was buried there in 1779. His grave was still a pilgrimage destination in the 1950s. Zakho was formerly known for its synagogues and large, ancient Jewish community and was known as "The Jerusalem of Assyria". The Jews spoke the Aramaic of their ancestors. The banks of the nearby Khabur River are mentioned in the Bible as one of the places to which the Israelites were exiled (1 Chronicles, 5:26, 2 Kings 17:6, 2 Kings 18:11). There were serious attacks on the Jews in 1891, when one of the synagogues was burnt down. The troubles intensified in 1892, with heavy taxes being imposed, outbreaks of looting and Jews being arrested, tortured and ransomed. Jews from Zakho were among the first to emigrate to Palestine after 1920. Most of the others relocated to Israel in the 1950s. While the Jews of Zakho were among the least literate in the Jewish diaspora, they had a unique and rich oral tradition, known for its legends, epics and ballads, whose heroes came from both Jewish and Muslim traditions. Zakho is the seat of a diocese of the Chaldean Catholic Church. It corresponds to the ancient Diocese of Malta, formerly a suffragan of Adiabene or Arbela. Some Assyrian bishops are mentioned from the fifth to the seventh century (Chabot, "Synodicon orientale", 676). Zakho had a reasonable amount of Assyrian Catholics, who primarily lived in villages north of the province. It was reunited with the dioceses of Akra and Amadia until the middle of the nineteenth century, when the province was divided into three dioceses: Amadia, Zakho, and Akra-Zehbar. The diocese comprises 3500 Assyrian Catholics, ten resident priests, five religious of the Congregation of St. Hormisdas, fifteen parishes or stations, twenty churches and chapels, and one primary school. Zakho has served as a checkpoint for many decades. It is a major marketplace with its goods and merchandise serving the Kurdish controlled area and most of north and middle Iraq. Writing in 1818, Campanile described the town as a great trading centre, famous for its gallnuts as well as rice, oil, sesame, wax, lentils and many fruits. Due to its strategic location and the abundance of job opportunities, Zakho has attracted many workers and job seekers from different parts of Iraq and even from Syria and Turkey. Trade with Turkey is now the major element of the economy. Oil drilling began in 2005. In 1991 Zakho was the centre of the haven established by the British and the Americans in Operation Provide Comfort to protect the Iraqi Kurds from being massacred by Saddam Hussein when he responded brutally to the Kurdish rebellion. Most of the inhabitants of the city had fled to the mountains. When the American forces arrived, they described the town as a ghost city. When the American Army closed its military base in Zakho in 1996, it evacuated several thousand Kurds who had had connections to the base and who feared reprisals. Many of them were given asylum in the USA. According to McDowall, this constituted a sudden and brutal brain-drain, with Zakho losing many of its most educated citizens. 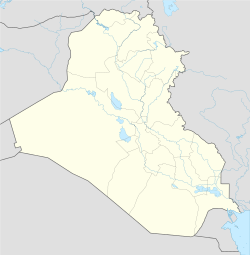 In 2008 it was reported that the Turkish army maintained four bases in the Zakho district, under an agreement concluded with the Iraqi government in the 1990s. The 2011 Dohuk riots which targeted Chaldean Christian-owned businesses were sparked by Muslim clerics in the town. Zakho castle lies in the city centre on the western bank of Khabir river. It served as the governor's house in the reign of the Badinan Emirate and was extended by prince Ali Khan. It was built on the ruins of an older castle. Today, only the tower remains. Qubad Pasha castle, in Zakho cemetery, is hexagonal, with six windows and an entrance gate. Many Assyrian people living in the diaspora, notably from American cities such as Nashville, Detroit, San Diego, Houston, and Phoenix, trace their origins to Zakho. In 2007, the UNHCR reported that there were still 10,000 internally displaced persons in the Zakho district as a result of the Iraq war. Zakho Football Club (Zakho FC) is a sports club in Iraqi Kurdistan, which was founded in 1987. The sports club plays in the Iraqi Premier League, where only the top 16 Iraqi football clubs play. Zakho FC has its own stadium with a capacity of 60,000 seats. Zakho Basketball Club (Zakho SC) is a team based in Zakho, Iraqi Kurdistan. In 2011 Zakho SC won the Kurdistan Basketball Super Cup and beat Duhok SC in Erbil. Wikimedia Commons has media related to Zakho. ↑ Directorate of Health in Zakho, Directorate General of Health Duhok. Retrieved 2014-01-31. ↑ 4.0 4.1 "Zaxo". Kurdawary. 2004. Archived from the original on 2009-10-25. Retrieved 2009-09-06. ↑ Bell, Gertrude Lothian (1924). Amurath to Amurath. Macmillan. Retrieved 2009-09-06. ↑ 6.0 6.1 Campanile, Giuseppe (1953). "Histoire du Kurdistan" (PDF). Le Kréyé. Retrieved 2009-09-06. ↑ Sabar, Ariel (2008). "My Father's Paradise: A Son's Search for His Jewish Past in Kurdish Iraq". Retrieved 2009-09-06. ↑ "Notes on Revelation, Eclipse Path, Turkey, Iraq". Judaeo-Christian Research. 1999-08-11. Retrieved 2009-09-06. ↑ Gavish, Haya (2009). "Unwitting Zionists: The Jewish Community of Zakho in Iraqi Kurdistan". Wayne State University Press. Retrieved 2009-09-06. ↑ Shai, Donna (2008-10-09). "Changes in the oral tradition among the jews of kurdistan". Contemporary Jewry - Springer Netherlands. Retrieved 2009-09-06. ↑ "Chaldean Parishes around the world". St Peter the Apostle Catholic Diocese for Chaldeans and Assyrians USA. Retrieved 2009-09-06. ↑ "KDP Flexes Muscles in Dohuk". Institute for War and Peace Reporting. 2009-07-21. Retrieved 2009-09-06. ↑ "Foreign oil deal renews debate on Kurd autonomy". USA Today. 2005-12-09. Retrieved 2009-09-06. ↑ Cavanaugh, John P. (1992). "Operation Provide Comfort: a model for future operations" (PDF). School of advanced military studies, Fort Leavenworth, Kansas. Retrieved 2009-09-06. ↑ McDowall, David (2004). A modern history of the Kurds. Tauris. Retrieved 2009-09-06. ↑ "Iraqi Kurdish Paper Says Turkish Military Bases Inside Kurdistan Region". iStockAnalyst. 2008-08-01. Retrieved 2009-09-06. ↑ Tawfeeq, Mohammed (3 December 2011). "Kurdish leader: Clerics 'instigated ... acts of sabotage,' wounding 25". CNN. Retrieved 4 December 2011. ↑ "GOVERNORATE ASSESSMENT REPORT: DAHUK GOVERNORATE" (PDF). UNHCR. September 2007. Retrieved 2009-09-06. This page was last modified on 22 April 2015, at 18:57.